Since last spring, more than 150 police officers, residents, survivors of violence, justice-involved citizens, social workers, and faith leaders came together last fall to participate in EJUSA’s inaugural Police/Community Initiative on Trauma-Informed Responses to Violence in Newark, New Jersey. 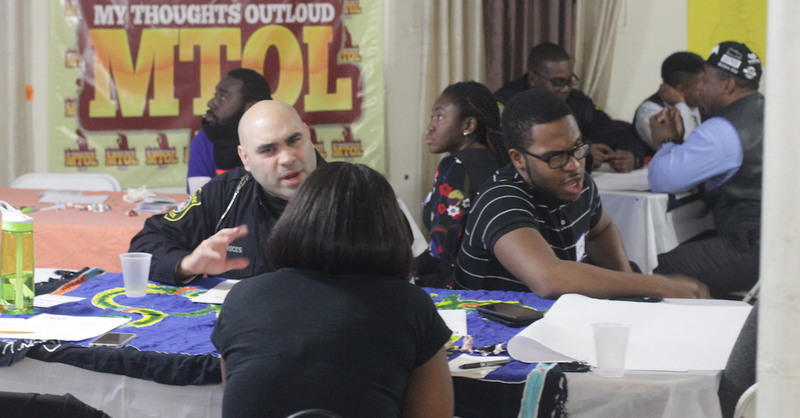 Through the initiative, participants learn about structural racism, trauma-informed practices, and work together to generate recommendations calling upon the police leaders and city/state government to make changes that will improve police/community relations and reduce violence and trauma. In January, EJUSA worked with local leaders to organize a community “Talk Back” to share the power and impact of the trauma trainings and present the top eight recommendations created jointly by police and the community. At the Talk Back, law enforcement and the community declared their support for recommendations and interest in advocating for system change together. These recommendations ranged from a statement of the police department’s historical involvement in the oppression of communities of color to creating a more robust trauma response system that puts the needs of crime survivors at the center of our responses to violence. A full list of recommendations will be made available in EJUSA’s upcoming report on Trauma-Informed Policing. This year, EJUSA will expand its trauma trainings by working more closely with faith leaders and schools to train an additional 150 participants in 6 upcoming trainings in Newark. We will also continue to work with the community on the implementation of their priority recommendations for system change.